Chemical management firm commemorates milestone and award with luncheon. Founded on September 13, 1989, Chemico Systems (Chemico), a Michigan-based chemical management firm, will soon mark its 25th year in business. Complementing this success, Chemico was also recently awarded its fifth consecutive GM Supplier of the Year Award. To help commemorate the occasion, the company hosted a 2013 Supplier of the Year Award Celebration and 25th Anniversary Luncheon at its headquarters in Southfield, Mich. on Thursday, June 5, 2014. 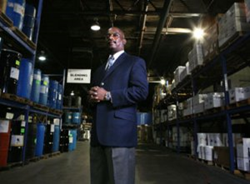 Established as a chemical supply and paint booth maintenance provider by entrepreneur and Marine Corps veteran Leon Richardson, over the last 25 years Chemico has grown to offer the full spectrum of chemical lifecycle management services with over 50 locations across North America and Europe. The company services a wide-range of clients, which include, but are not limited to: General Motors (GM), Chrysler, Toyota, Honeywell and Delphi. Growing steadily since its inception, Chemico has increased its revenue by more than $30 million in the last year alone and continues to see significant growth moving through 2014. GM executives, including Lieblein, prominent members of the community and Chemico suppliers and employees attended the celebration. AirGas, a specialty gas and equipment provider, was named Chemico’s Supplier of the Year. Rhonda Walker, WDIV anchor and long-time friend of Richardson, hosted the event. ChemicoMays specializes in providing an integrated solution for the chemical lifecycle – from sourcing and procurement, to lean hands-on management, through environmentally conscious disposal. Founded in 1989, the organization has continued to experience positive growth year over year since its inception. ChemicoMays serves customers across a variety of industries including automotive, aerospace, biotech and pharmaceuticals. The company operates more than 50 sites throughout the U.S., Canada and Mexico. ChemicoMays’ past and current customers include General Motors, Fiat-Chrysler, Ford, Eaton, Toyota, Boeing, Amgen, Delphi and Honeywell. For more information, visit http://www.chemicomays.com.